I joined another monthly blog challenge. This one's all about cookies! I'm hoping that the cookie one and the salad one will cancel each other out! ;) It's hosted by Cynthia of Feeding Big. I rarely make cookies, but I have been wanting to get my girls more involved in the kitchen and I think making cookies is a good way to do that. Having them help at dinner just doesn't work that well for me as I have been alone with them all day and am definitely needing a break when it's time to make dinner. So having them help me make cookies earlier in the day is perfect. This month's theme is Kids' Favorites/Back to School. My kids don't go back to school until after Labor Day, so I am nowhere near ready to think about that yet. So I decided to post a cookie recipe that is definitely a huge hit with my kids and is perfect for this time of year. I actually made these cookies last summer, but never got around to posting the recipe. The flavors in these cookies are reminiscent of the summertime classic, the orange creamsicle. Orange zest and extract combine with vanilla chips for a fun sweet treat. I got the recipe from The Girl Who Ate Everything. In a large bowl, cream butter and sugars until light and creamy. Beat in egg and orange extract until smooth. Gradually add flour mixture until combined. Stir in orange zest and white chocolate chips. Drop rounded spoonfuls onto ungreased cookie sheets. Do not flatten cookies; it will make them dry. Bake 8 - 10 minutes or until golden brown around edges. Do not overcook! Cookies will be plump. Cool for several minutes on cookie sheets before transferring to rack to cool completely. Store in airtight container. Makes 3½ dozen small (2½”) cookies. Oh boy, are these good! They have just the right amount of orange hint to them (I added some orange extract to up the orange flavor a bit) and the white chips are so tasty. I made these for a small party we had the day my niece was baptized and they were a huge hit. I made them again later that month for a home blessing potluck. If you like creamsicle-inspired desserts, check out the Orange Creamsicle Cake I posted earlier this week. Come back next month to see what fall-themed cookie I come up with. What great flavorings - love the creamsicle idea for a cookie! Wow! These cookies sound so good. I was in the store yesterday and I saw dreamsicles and I thought about my childhood! These are perfect back to school cookies! Thank you so much for sharing in the Fill The Cookie Jar group! I am so glad to meet you (hello new friend) and to follow your blog! By the way, I read your bio and you make me think of myself! I am always trying new recipes! Your girls are adorable! I have a link party that runs once a month for Main Dishes Around $5.00. I would love it if you would link up in August! I bet you are like me and have some great inexpensive meals to share! 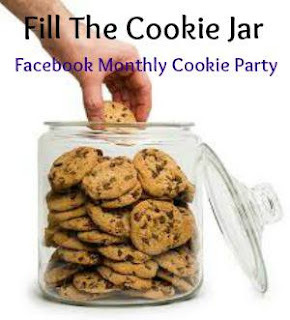 Also, I run a regular link party on Monday evening through Wednesday. Oh my! Now I sound spammy! Not my intention, just glad to make a new friend and share! YUM! You can't go wrong with anything creamsicle! I loved orange creamcicles as a little girl. I'll bet these are terrific. Woah, these are different. I bet my bf would like these. Maybe I'll save this recipe for his birthday :) Thanks! I make a similar recipe, so I know these are fabulous. Love the creamsicle flavor! What a great flavor combination for a cookie! Very creative!